Home > The Merk Perspective > Worried About Rising Interest Rates? Worried About Rising Interest Rates? The Merk Hard Currency Fund (MERKX) normally invests in a basket of hard currency denominated investments composed of high quality, short-term debt instruments of countries pursuing “sound” monetary policy. The average maturity of these debt instruments has historically been less than 180 days. In an environment with historically low interest rates, investors have been pouring money into longer-duration securities, substituting 3 or 6 month T-Bills with 10-year Treasuries or bond funds. However, this strategy is not without risks. Investors may want to consider fixed income investments at the short-end of the yield curve to take advantage of the diversification benefits fixed income investing may offer, while seeking to mitigate interest risk. The Merk Funds are firmly committed to fixed income investments at the short end of the yield curve. Investors should be mindful of the potential risks associated with investing in longer-duration fixed income securities, especially if they harbor concerns over inflation or rising interest rates globally. As interest rates rise, fixed income securities typically fall in value: the longer the duration of the security, the greater the fall in price. Moving out on the yield curve may also have become a crowded trade. Should we witness a substantial reversal in sentiment, the risk of large movements in price may be compounded, as many investors scramble to exit their positions. Learn more about the Merk Hard Currency Fund. Longer duration bonds may exhibit fat tail risk and a greater likelihood of black swan events. You don’t even need to consider an extreme (albeit possible) future scenario, such as the Chinese or Japanese dumping their U.S. debt holdings, for this to occur: research conducted by the Federal Reserve Bank of St Louis found that 10 year Treasury prices exhibited much wider tails than would be expected by a normal distribution, commonly referred to as fat tails. The research found that there are 16 times more price changes in excess of 3.5 standard deviations than expected with a normal distribution. Furthermore, whereas changes in price greater than 4.5 standard deviations would occur only 7 times in a million under the normal distribution, the findings showed 11 changes in 6,5731. One only needs to look to the recent financial crisis as an example of how fat tails events (often called black swan events) can wreak financial havoc if not properly addressed as part of risk management. With very low rates available at the very short end of the curve in the U.S., investors may want to consider diversifying internationally. 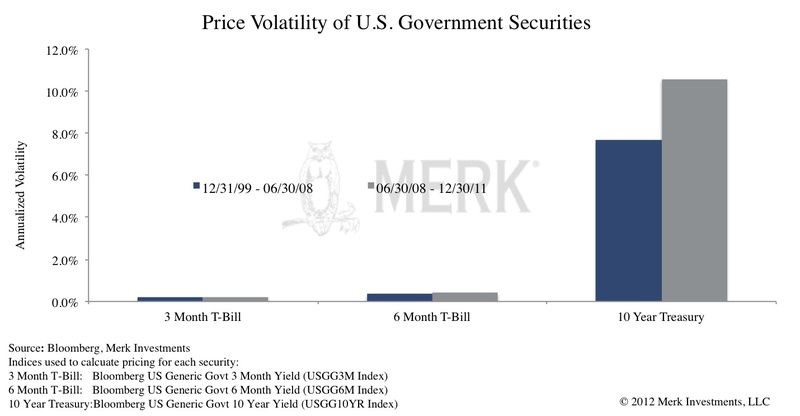 In addition to many other benefits, relatively higher yields may be found in securities issued by governments outside of the U.S., with the same duration. Indeed, we have already witnessed many international central banks raising interest rates recently. As such, investors may want to consider investing in international fixed income at the short end of the yield curve. The Merk Hard Currency Fund (MERKX) typically invests in a basket of hard currency denominated investments composed of high quality, short-term debt instruments of countries pursuing “sound” monetary policy. The average maturity of these debt instruments has historically been less than 180 days. Both the Merk Asian Currency Fund (MEAFX) and Merk Absolute Return Currency Fund (MABFX) have historically utilized forward currency contracts to gain currency exposure. The notional value of these contracts is typically fully collateralized with U.S. T-Bills or other money market instruments. Obviously, with any international fixed income investment, investors are also taking on currency risk. However, many investors may see this as an opportunity to add a potentially uncorrelated exposure to their portfolios. Since the Funds primarily invest in foreign currencies, changes in currency exchange rates will affect the value of what the Funds own and the price of the Funds' shares. Investing in foreign instruments bears a greater risk than investing in domestic instruments for reasons such as volatility of currency exchange rates and, in some cases, limited geographic focus, political and economic instability, and relatively illiquid markets. The Funds are subject to interest rate risk which is the risk that debt securities in the Funds' portfolio will decline in value because of increases in market interest rates. The Funds may also invest in derivative securities which can be volatile and involve various types and degrees of risk. As a non-diversified fund, the Merk Hard Currency Fund will be subject to more investment risk and potential for volatility than a diversified fund because their portfolios may, at times, focus on a limited number of issuers. For a more complete discussion of these and other Fund risks please refer to each Fund's prospectus.